Birkdale School > News > Prep School News > Happy Blue Monday! We were delighted to welcome Daniel Cutting to Birkdale today. The third Monday of January is known as Blue Monday, the gloomiest day of the year – but not here at Birkdale! Daniel is a world renowned Professional Football Freestyler and FIVE-TIME Guinness World Record Holder. His skills have taken him all over the globe and seen him work with some of the world’s biggest brands. 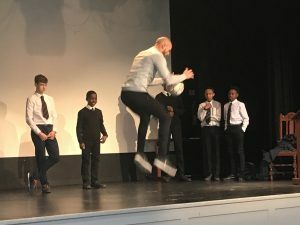 He thrilled the Senior and Sixth Form pupils with his skills and tricks and talked passionately about perseverance, determination and his Christian faith. A number of boys were lucky enough to perform skills with Daniel and did extremely well under significant pressure! Daniel then visited the Prep School where he received a very warm welcome in their assembly. The boys were very excited by Daniel’s footballing skills and were most impressed when Daniel confessed to being a stunt double for some of the world’s most famous footballers. 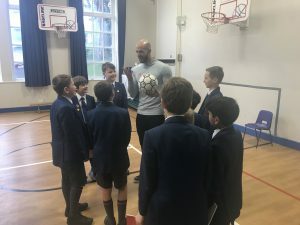 His message of perseverance continued when he told the boys that we all have God-given talents which need to be nurtured, so that we can be the very best we can be. He was bombarded afterwards by autograph requests from enthusiastic fans before leaving for Castle Dyke. The fun continued with a skills training session at Lower School Games, where the sun broke through momentarily. 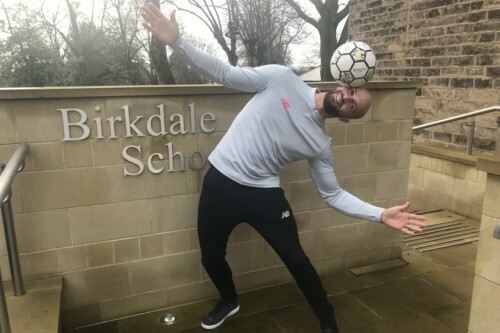 Our thanks to Daniel for visiting Birkdale and making Monday morning so exciting, setting everyone up for a fantastic week. Here are two short videos demonstrating some of Daniel’s skills.